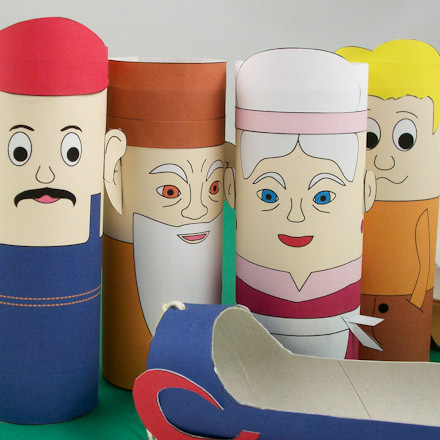 In this project, use empty toilet paper tubes to make finger puppets, then put on a play that features them. The puppet play in this project, Grandfather's Advice, is based on a folktale from Latvia. 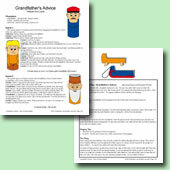 This project includes printable patterns for the play's characters, props and ideas for staging the play. 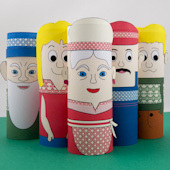 Once you make the puppets in this project, use your creativity to make puppets of your own design. A tube can be a puppet's head or half head and half body. 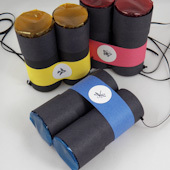 The tube can be used upright or horizontally to make a variety of puppet shapes—animals, people, or vehicles. Cover the tube with decorated paper, or paint it, and add cut-outs. This craft is part of the series of puppet making projects that include puppet plays based on folktales from cultures around the world and back in time. 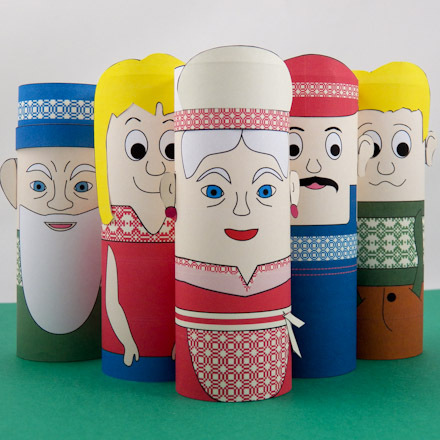 A Latvian folktale is the basis for a play, Grandfather's Advice, using puppets in this project. Optional: Paint and paintbrush, fake fur, yarn, ribbon, lace and cloth. Each puppet pattern includes colored and black & white versions of the tube cover and puppet cutouts. For the most creativity, use the black & white patterns and color the puppet cover and cutouts any way you	like—use your imagination. Tip: Instead of using a tube cover, you may paint the toilet paper tube. In that case, you will only need the cutouts. Cut the tube cover and cutouts for the puppet. The Farmer puppet includes a tube cover with head and overalls and cutouts of a hat and ears. The ear cutouts are optional. The Grandfather puppet includes a tube cover with head, hat and shirt and cutouts of the hat brim and ears. The cutouts are optional. 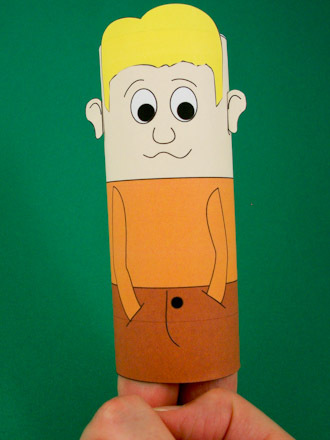 The Son puppet includes a tube cover with head and clothing and cutouts of hair and ears. The ear cutouts are optional. 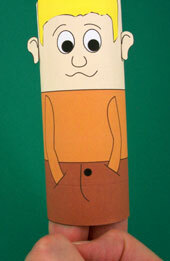 The Daughter puppet includes a tube cover with head and clothing and a hair cutout. The Grandmother puppet includes a tube cover with head, dress and apron, along with cutouts of hat, apron ties and ears. The ear and apron tie cutouts are optional. The Bed prop includes a tube cover and bed legs. 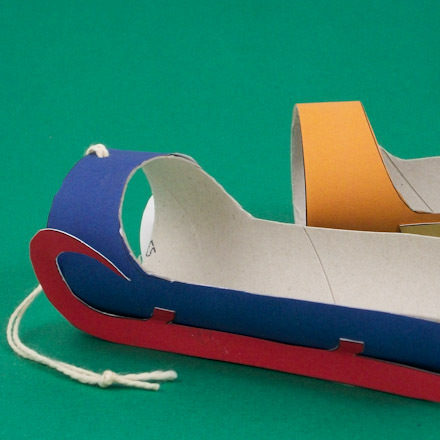 The Sled prop includes a tube cover and sled runner cutouts. Wrap the cover around the toilet paper tube to see how it fits. Toilet paper tubes in the U.S. are generally 4½ inches long and 5 to 5½ inches around. Trim the paper if needed, or cut strips of paper for any uncovered sections. Glue the cover on the tube. Glue on the cut outs. The ear cutouts are optional; to use them, fold the glue tab, then glue in place over the printed ears on the tube cover. See the sidebar for how to construct the dragon puppet. For the Farmer puppet, wrap the hat around the top of the tube and glue. For the Grandfather puppet, wrap the hat brim around the tube and glue. Fake fur can be glued on the beard. For the Son puppet, glue the hair to the top of the tube. Instead of using the cutout, the hair could be made of yarn or fake fur. For the Daughter puppet, glue the hair to the top of the tube. For the Grandmother puppet, glue the hat to the top of the tube and wrap the hat band under it around the tube. Glue the ears and apron ties in place. For the Sled and Bed props, glue runners to the sled and glue the legs on the bed. Glue where X's are marked. Cut away the top of the sled and bed as marked. Attach a pull rope to the sled top. Add any additional decorations you might like to complete the puppet. Yarn or fake fur can be added for texture. Additional cutouts for clothing or tools could also be added. 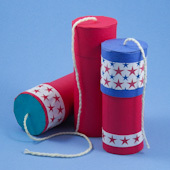 To operate a puppet, put two or three fingers into the bottom of the tube and fold the others over. For the sled and bed props, optionally cut the circle in the bottom for a finger hole. Use the play included in the project, Grandfather's Advice, or come up with your own ideas. Think of what your puppets will do. Where does your play take place? Write down what the puppets will say and figure out how they will move. Will more than two puppets be on stage at once? Do you need a friend to help? Rehearse your play a few times and then perform it for family and friends. That's it! 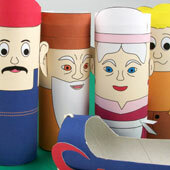 Your TP tube puppets are complete! Puppet Play: A folktale from Latvia is presented in the play, Grandfather's Advice, that features the puppets in this project. 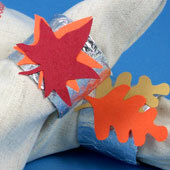 Tip: Place two or three fingers inside puppet. If you use two fingers, they will look like legs on some puppets. Tip: Add a string to the sled to use as a pull. 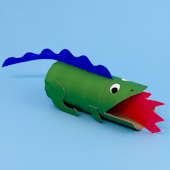 Tip: The dragon puppet has cutouts for a ridge tail, two front legs, and two back legs. Glue them to white cardstock and cut out. Color the back of the ridge tail. Glue the legs to the locations marked with x's. Run a line of glue down the dragons back and set the ridge tail in place. Hold until it sets. Cut away the tube where mouth is marked, and cut a finger hole in bottom as marked. Cut flames form red or orange paper and glue inside the mouth. To operate the puppet, place your index finger in the finger hole and support the puppet with the thumb. Tip: In Latvia, traditional clothing features intricate woven or embroidered designs. Make the patterns with Latvian Designs for an authentic look. Tip: Present the play using either the son or the daughter, or maybe both. 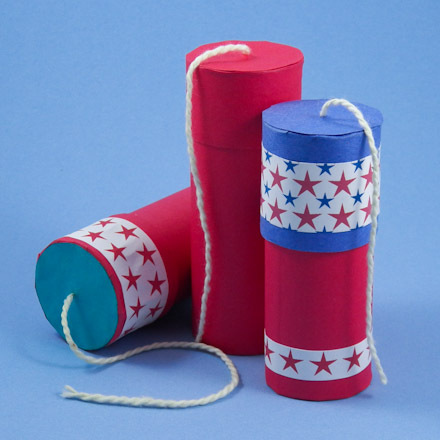 Related craft: For more fun with cardboard tubes, make Fourth of July Crackers that actually go POP! Related craft: See the world through colored lens with Multicolor Binoculars made from empty bath tissue tubes. 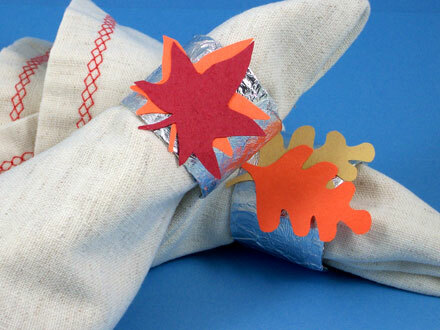 Related project: Cut rings from toilet paper tubes to make Thanksgiving Napkin Rings.